If you’ve fished around Frazer Lake on Kodiak Island over the last 20 years, odds are you’re familiar with jack salmon — a salmon, usually sockeye or a king, that returns to its natal stream after an abnormally short time at sea. For sockeye, that’s one year; for kings, one to two. Because jacks spend less time at sea and have less time to grow, they’re much smaller than normal. At Frazer Lake, the sockeye making their way up the river have, a few times since the year 2000, been almost 50 percent jacks. That creates problems for Kodiak fisheries staff tasked with managing for commercial value. But before they can figure out what to do about jacks, said Kevin Schaberg, Western Region Salmon Research Supervisor for the Alaska Department of Fish & Game, it’s important they figure out what jack salmon mean and why the run at Frazer Lake has such high numbers of them. “Jacks are important to your population. Just saying ‘kill them all’ isn’t probably going to solve (the problem.) But on the other hand, too many jacks isn’t a good thing either, so we’re trying to figure out where that happy medium is,” Schaberg said. Schaberg and colleagues reached out to the University of Washington’s Alaska Salmon Program, which has been researching sockeye salmon in the Bristol Bay’s Wood River watershed for more than 60 years, asking for help looking into exactly what’s going on at Frazer Lake and how to address it. 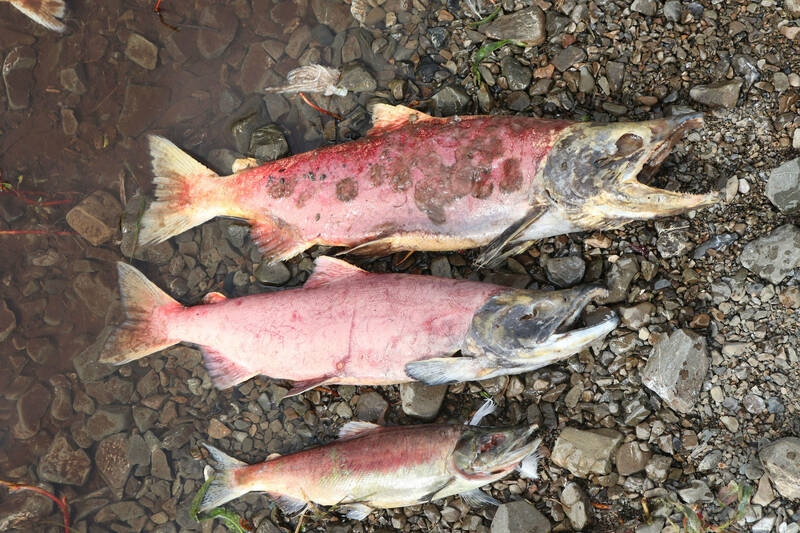 Ironically, salmon are more likely to become jacks when their growing conditions are good, meaning that as juveniles in their natal streams or lakes, they grew faster. “If they reach a certain body size or body condition by a certain age, (their bodies) will make a decision to become jacks. Any juvenile male salmon could become a jack,” said Lukas DeFilippo, a PhD student at the University of Washington’s School of Aquatic and Fishery Sciences. DeFilippo is writing his dissertation on jack salmon and is helping look into the Frazer Lake situation. Jack-fertilized eggs are also more likely to become jacks, themselves, he said. “Jills,” or female salmon that return after only a year at sea, are rare in part because for females, smaller body size means fewer eggs. Jacks, on the other hand, can potentially produce the same amount of offspring as a typical adult sockeye. Becoming a jack is a tradeoff, DeFilippo said: more jacks survive the ocean because they’re there for less time, and once they return to their natal streams, they’re less vulnerable to bears. But they also have less success passing their genes on to the next generation, as both males and females chase them off redds. As a result, instead of courting female salmon, they hide behind obstacles and sneak in to fertilize just-laid eggs. DeFilippo has found that means streams with more predation from bears — small and shallow streams — have higher levels of jacks. So do streams with lots of cover for sneaking. Why is the jack percentage at Frazer Lake so big? Normally, though, “higher levels of jacks” means, at most, ten percent of a run. In Bristol Bay’s Wood River system, jacks tend to be between one and two percent of a population, DeFilippo said. At Frazer Lake, sometimes the jack run appears bigger than it is because the year the jacks were born was a productive one, while salmon born the couple of years before (and returning the same year as the jacks) may have hit difficult circumstances. That, Schaberg said, can make the jack percentage look much bigger than it is for the jack’s actual birth year. The size-selective fishery is also likely contributing to a larger-than-normal looking jack return. Smaller fish jacks have an easier time escaping nets, so they’re more likely to make it up the river. The main thing, however, that makes Frazer Lake so different is likely what makes it unusual to begin with: it’s a manmade run created when managers introduced salmon — and salmon ladders — there in the 1950s and 1960s. The jack percentages at Frazer Lake do appear to be declining in recent years, Schaberg said. It may be that over time, as the run becomes more established, the jack population would even out — but what amount of time? Whatever ADF&G ends up doing, Schaberg said he wants to be sure they first have the science to know, for sure, that it’s the right thing. “I really just come back to, ‘This is a new population. Do we expect it to function like a system that’s been around for centuries?’ I don’t. We don’t have a lot of observations throughout history of a newly initiated sockeye population and what happens with that over time,” Schaberg said. “This is the first and only wild population to have an issue like this for a sustained period of time,” DeFilippo said. Jacks are an important part of most, if not all, sockeye runs, serving as genetic protection against sudden environmental changes. For example, jacks returning from the ocean may not be as affected by the “warm blob” in the Gulf of Alaska that scientists think may have affected many of Alaska’s salmon returns in 2018. One of the things DeFilippo is looking at is the sweet spot between providing “insulation from catastrophic events” and the ability to maintain an economically viable salmon population. • Mary Catharine Martin is the communications director of SalmonState, a nonprofit initiative that works to ensure Alaska remains a place wild salmon thrive.